Continuing on a cheerful theme of cat related crafts (I’ve not quite got to grips with Halloween yet this year, so I thought cats might be better!) Maddy has produced her signature cat in Hama Beads. Many years ago, though she doesn’t remember, they used to have a Willo the Wisp video and I think she is secretly channeling Carwash with this design. Here he is, in all his glory. A nice easy cat on a rectangle (or two interconnected square boards) in Midi Hama Beads. Maddy chose to do him in blue with black, white and pink details and I think you should be able to follow him from the photo. We will get round to doing a printable version of him too! It was an accident but we quite like the little angle to his head. If you want to copy it, just gently stretch the beads and mould it while it is still warm from ironing the pattern. There are more ideas on BeadMerrily. It’s been such a long time since I did any polymer clay work that all my talent seemed to have deserted me when I sat down to make a start on this little chap. In fact it took nearly a week and endless prototypes before I started to feel like I was finding my fingers with it again. In the end though, I’m rather pleased with this little chap. He’s a great Halloween Cat and easy to make with some patience too. I started with the orange one (who I think I probably like the character of the best really) and made the brown one to photograph a tutorial. We had a lot of fun together and hopefully these fairly brief photo instructions will help you too. As usual, all my Fimo came from our shop CraftMerrily. We are always very pleased to welcome new customers and grateful for their purchases! 1. First, whizz up your chosen colours into a blend that feel furry to you and divide into balls for head, body, neck, legs and tail. I made my leg balls roughly twice the size I needed them here, so scale back a bit there! 2. Make the body a bit egg shaped and then put a flattened neck ball on top. I added a flat disk of cream to his tummy for a splash of colour. 3. Mould the ear points out a bit (and they need to go through a hat so make them slightly too large. I use a pointy tool to make ear dimples; if you fancy it you can fill them with a small pear drop shape of a different colour. Push your thumbs into the sides to make eye sockets and then press a round tool in to those sockets to make the eye ball hole. 4. Two flat pancakes of colour go into the eye sockets. I like translucent Fimo for this. I use a knitting need to make hole in that and then push two beads in for pupils. 5. Create the small pieces shown in the middle right picture and attach them to the face. How these are placed gives character and expression, so experiment. 6. I use a knitting needle to give furry blending detail now. Blend the eye lids, soften the ears, add fur to his face and blend the triple nose piece to the face. Add whisker dots to the cream and nostrils to the black nose. 7. Attach him to his neck and blend those 3 pieces together. I know cats don’t have very obvious necks but it just lengthens his figure a bit. Add furry detail across the body front, especially blending the tummy patch if you’ve made one. 8. Getting the arms and legs right is tricky. Remember to give elbows (no one has joint free limbs, it just looks wrong) and experiment with paws. Chunky is good, delicate gives a different look (more female). Add three dents to the paws for claws/footpads. 9. With the back legs, a change in angle helps the feet look real. Model the shape in the bottom right picture and add a detail by scoring a line around the ‘ankle’ and then pressing the leg and foot together again. It makes it look more defined. Add creases at the next joint. Make the side attaching to the body flat and the outer side more rounded. You can see this better in the top picture below. 10. Attach the limbs and position to give the attitude you like. Once the look and feel right, blend the hips and shoulders on to the main body so the join isn’t obvious. Don’t blend too far down or he will look as if his legs are stuck to his body in a weird body lock spell. Add furry detail to his limbs and his back. 11. Mould a tail in a shape that suits him. Make one end thick and flat and then sit him on it and blend as before. Looks better than being stuck to the back and is stronger too. As usual, I created a Pinterest board to inspire me. You might like some of these Cat Crafts too. It’s been a bit quiet here lately; I took some time out to enjoy my little boy, since he’s growing up all too fast and needed lots of mummy attention but I also found myself (as I’m wont to do) setting up a new shop for all the beautiful craft supplies that I like using on this blog. And that took some time too. However, the crafting hasn’t entirely stopped and I’ve got plenty of projects put aside to blog about or ones I’m about to make. My trusty army of helpers have all departed for school now, after years of home education and being on hand to craft, so I might have to do more of the leg work myself. I’m pretty sure Maddy will still be on hand to help though. 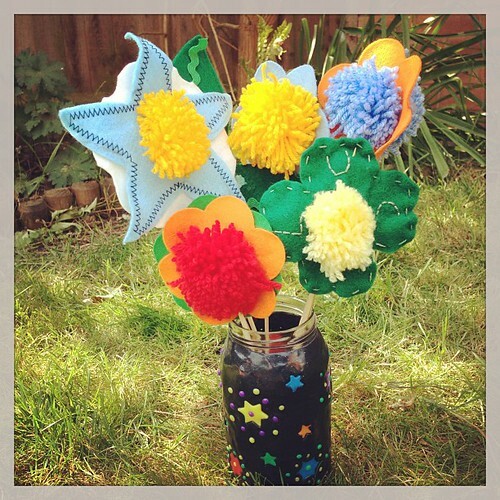 Here is a pretty bunch of flowers we all constructed together one morning, combining pom poms and felt flower petals, sat on top of long wooden kebab sticks. I started off with some simple 6 petal flower shapes with a hole cut in the middle that came from some craft kit or other, long ago butchered and popped into the cupboard as remnants. Popping a pom pom through the middle of this was easy and the stick sits securely into the centre of it too, so no glue really required. Put the pointy end downwards into your vase if you are worried about safely though, or cut it off beforehand. After that Maddy and I got creative; she hand stitched some clover leaves in green felt and I had a go at machining onto felt too just to try and get my hand in with my new machine. Layers of different shapes put together make for charming (if not terribly real!) flowers and leaves decorated with ric rac can be glued to the back or skewered with the sticks. We will be back later with a flower shape printable, but for now, one craft for the blog as a signal that we are back! Owls seem to be very popular at the moment and my daughters are always asking me to draw some owls to colour in. I’ve drawn or coloured quite a few owls recently and have worked out some basic shapes (and variations) to use to form the owl. I even made a colouring sheet, so other people’s children could colour in my owls, too – in case they wanted to as much mine! Download the OwlCutOut and then print three copies, each onto different coloured card. Then cut out all the shapes. If you can, cut just inside the lines, so you don’t have any lines showing. You could also cut along the lines and use the pieces upside down (though you’d need to use them all upside down for them to fit). And then stick them together, using the colour combinations you want. You can also decorate them with extra elements. I used some of the off-cuts from the card and punched lots of holes and then used some of the circles to make a pattern on one of the owls. You could also add stickers or draw on patterns, or glue on any other crafty bits and pieces you have. And you can even use the off-cuts to create another picture. Tasha Goddard has been drawing since she was three and hopes never to stop. She blogs about her artwork at Tasha Goddard Illustration, and also has a Facebook page. You can follow her on Google+ and Twitter, too. Maddy twizzled up a window display in pom poms and foam sheets this week to cheer up the frankly unimpressive winter weather and make it feel a little more spring like at home. Our trusty pom pom makers (coming soon to a brand new online craft shop near here 😉 are favourites with us and the rabbit and chick are made from the 2 medium large sizes. Any dk yarn will work – Sirdar and Robin do cheap ones. Some big googly eyes glued on, with the head and body also glued together (PVA works well) and ears, feet and beak cut out of foam sheets complete the look. Maddy finished the scene off with foam grass banks and pom poms made in several green, yellow and brown shades to make bushes. I rather liked the nest – its just the end of a ball of brown wool fluffed out underneath that Easter chick. I have to say the rabbit looks a little nervous, but that is a VERY. BIG. CHICK. Here is a craft Maddy did last year for our family blog in time for St Patrick’s Day. In fact, we did it a month early as I had just had a baby and got confused about the date! I finally got round to finishing these little love hearts last night; rather late as a Valentine craft so I think I might start my Mother's Day crafting with them instead! I cut fimo hearts out using a cookie cutter in red, pink and lilac (I lie, Maddy did this bit for me in fact 🙂 ) and then experimented with different powder layers on top of each other until I had a different look for each heart. Last year I bought some metal letter stamps from eBay too, which were £10 for the box. There is a bit of a knack to them but I managed to stencil each of my children's names on to a heart and then decorate the rest to suit. With some of them I did a layer of powder afterwards to accentuate the letters a little. I wanted to help a group of girls make something really pretty as a quick craft in a short session this week and came up with this idea. I then drew some quick heart shapes using a word processing programme (templates to follow) and they cut out two sides of each in felt of their choice. We had threads, buttons and sequins out and the decided each side of the hearts to suit themselves. Decorate each side first, then blanket stitch them together with a little stuffing if you wish. Once completed, they threaded a bodkin with a cotton based yarn (won't stretch) and threaded it through the hears and pom poms, tied knots below each element to secure them and hung them up. Ideally they will look lovely in a window or below a light shade; we hung these on a door. You could use ribbon to thread them; in this case place the ribbon through the pom pom before cutting and tying it and place it through the centre of the heart before you stitch it together. You need red, yellow and blue acrylic yarn and some different coloured pipe cleaners plus something to make eyes; paper, felt or googly eyes will work. First make 4 medium pom poms, roughly the size of the palm of an adult hand. These pom poms are work out as mostly red, with 1/6 of it wound in yellow. This makes the stripe down his back. Next make 2 or 3 similarly coloured smaller ones to make the tail, getting smaller as they go along. You can decide how long to make his tail depending on how patient you are. Make another red/yellow medium one to be the nose and a really big one in the same colours to be the head (so, 5 medium, 1 large and 2-3 smaller ones). Next a thinner pom pom (not too thickly wound) in blue to be the ruffle round his neck. Now thread yarn through the centre of each pom pom (best to use a thick needle) in this order (medium, large, ruffle,, medium, medium, medium, smalls) and make a really big knot or thread a bead on each end and knot it to make the ends secure. To make feet, fold a pipe cleaner over the central yarn and twist it round to secure it as two legs, then make feet at each end. You could decorate the feet with felt or foam. Do one set near the head and one set near the tail. Do similar ones with more pipe cleaners as horns and spikes wherever you fancy. Some between the nose and head look good as whiskers. Finish off with eyes. We tied some string lengths to places along the central yarn to hold it up. If you attach that to a stick, you get a pom pom puppet! Maddy has a great craft lined up for tomorrow but I’m hoping I might persuade her to do another dramatic and brand new hama pattern too. These sort of worked – we had another go and made each individual piece too but the bumpy edges meant they weren’t good enough to play with. Did inspire the kids to actually print off some paper ones though. 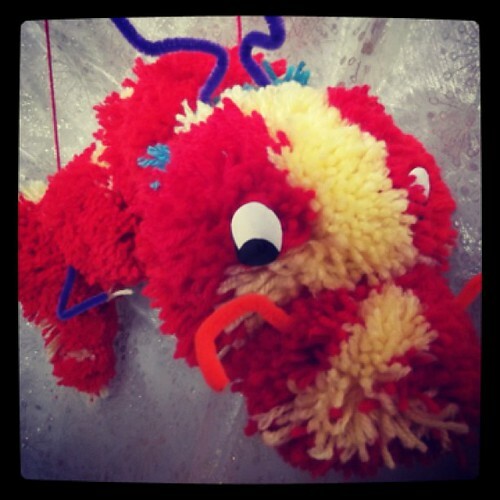 One of the younger children made Chinese people. Clearly the whole red and gold thing had hit home, even if nothing else did! I’m a little out of the blogging habit just now, what with one thing and another (and a lovely blanket to crochet!) but hopefully putting up a recycled craft here will inspire us all to be more creative tomorrow!